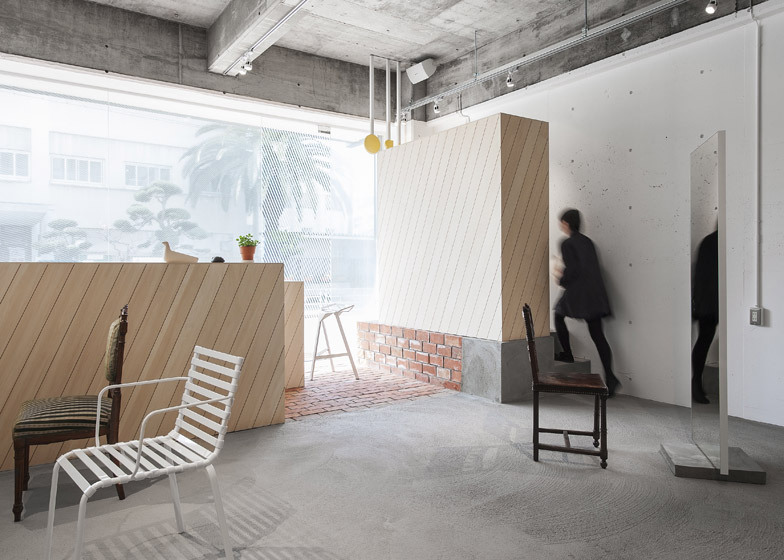 Here's another project from Japanese designer Reiichi Ikeda, this time a hair salon in Osaka with diagonally striped wood and frosted glass (+ slideshow). 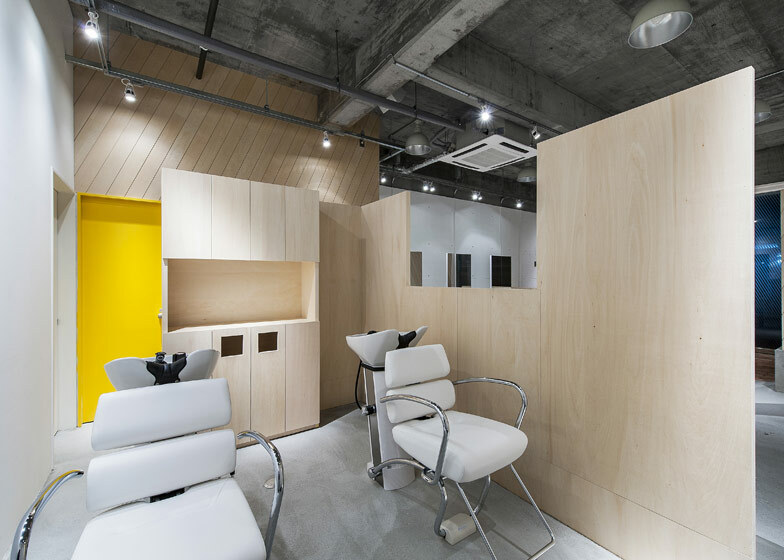 The salon's sparse interior contains a wooden counter and screen walls which hide the storage and washing areas. 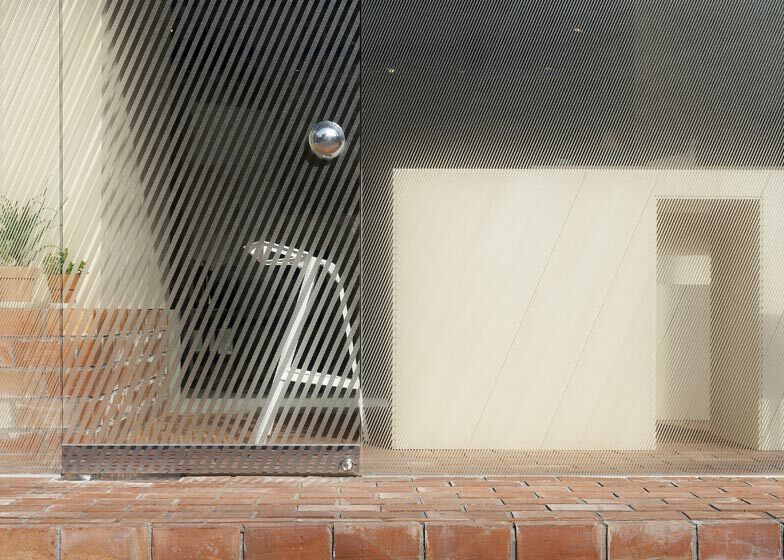 The glass on the shop window is frosted with stripes intended to produce a flickering moiré pattern at viewpoints where they overlap. The angle of the lines matches the IRO logo, in which the 'O' has been rotated to the same degree as the axis of the earth. 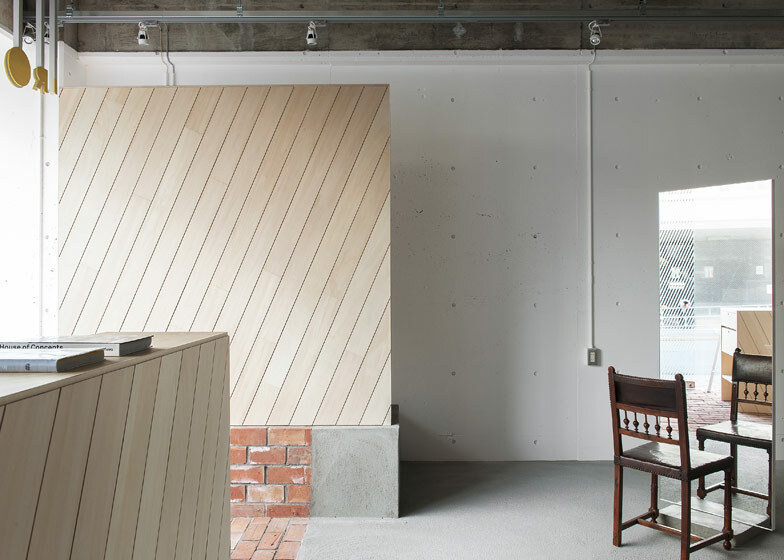 Ikeda worked on the concept and the graphic design with Yuma Harada of UMA/design farm. 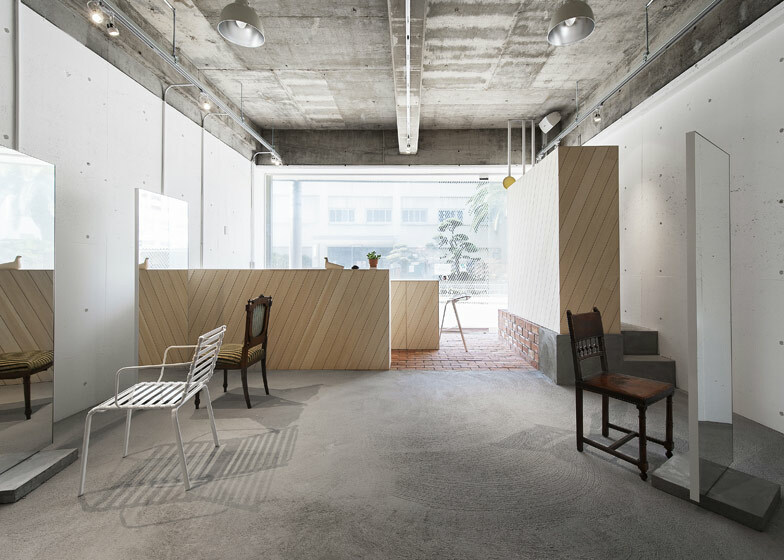 The bare concrete floor and exposed ceiling make the shop seem unfinished, like the Osaka fashion boutique designed by Ikeda that we featured earlier this week. 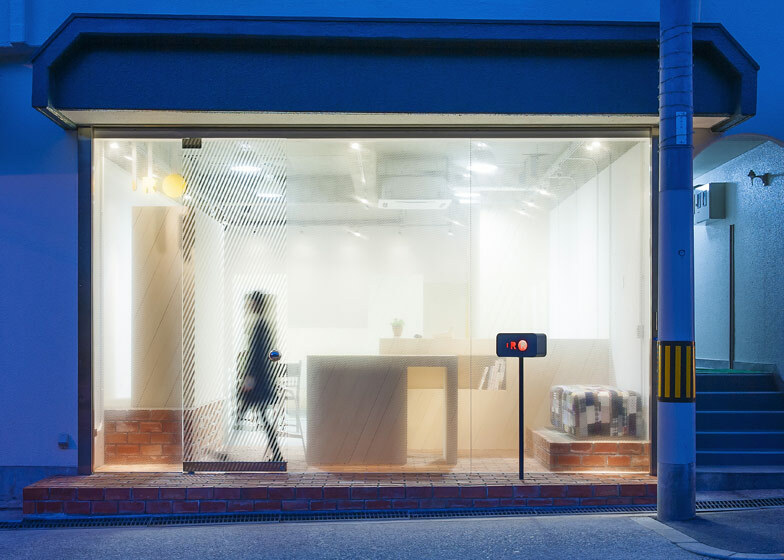 Another Ikeda design we featured recently was a clothes shop with a wire-mesh box inside it. 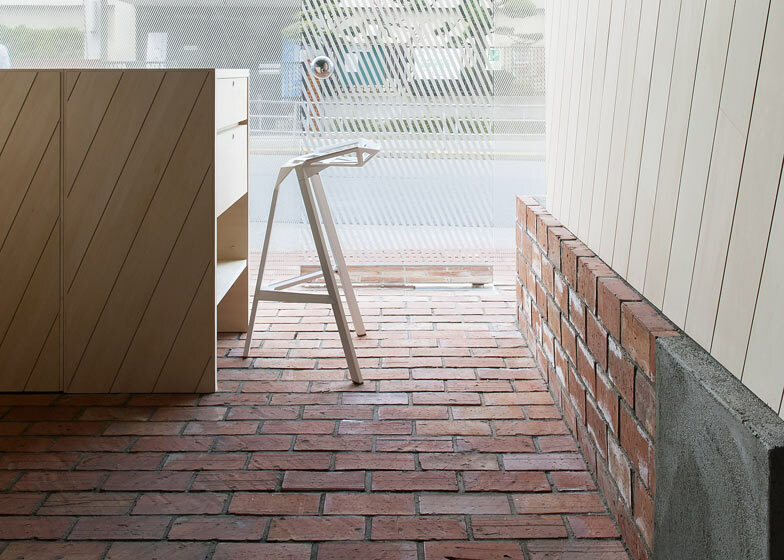 Photographs are by Yoshiro Masuda. 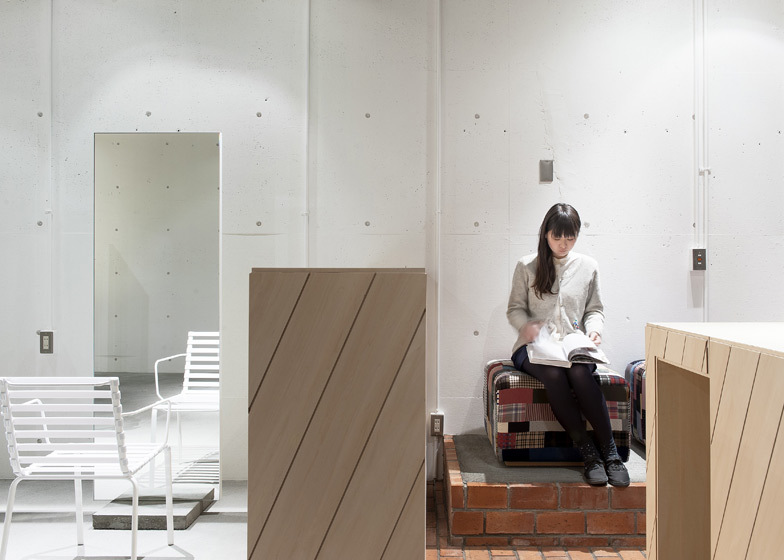 This is an interior design for a hair salon in Osaka, Japan. 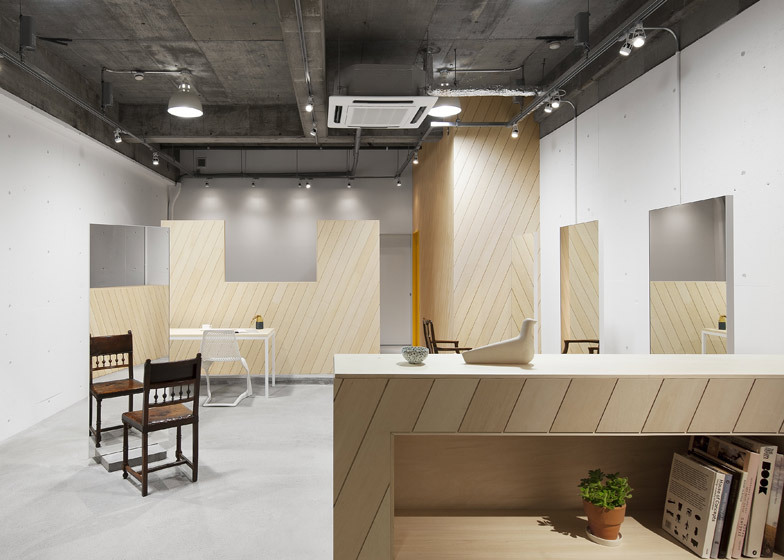 The interior design was by Reiichi Ikeda of reiichi ikeda design, and the graphic design including the logo design was by Yuma Harada of UMA/design farm. 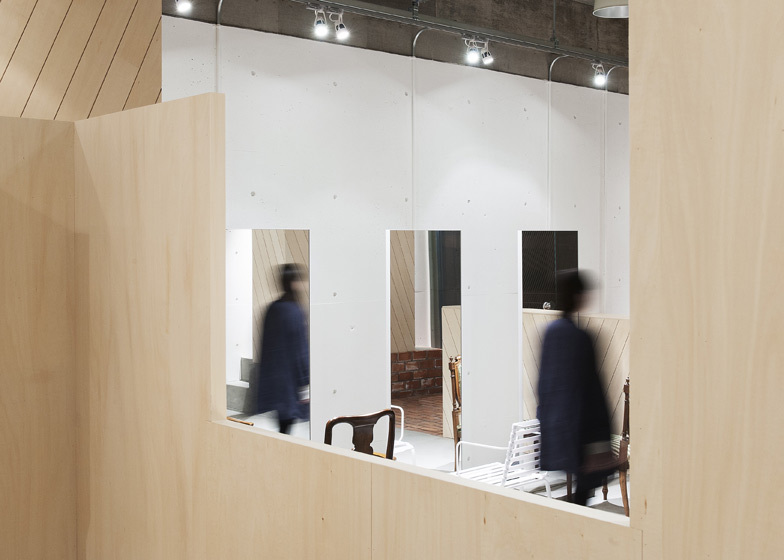 The two companies shared the concept with each other and comprehensively directed the hair salon together. 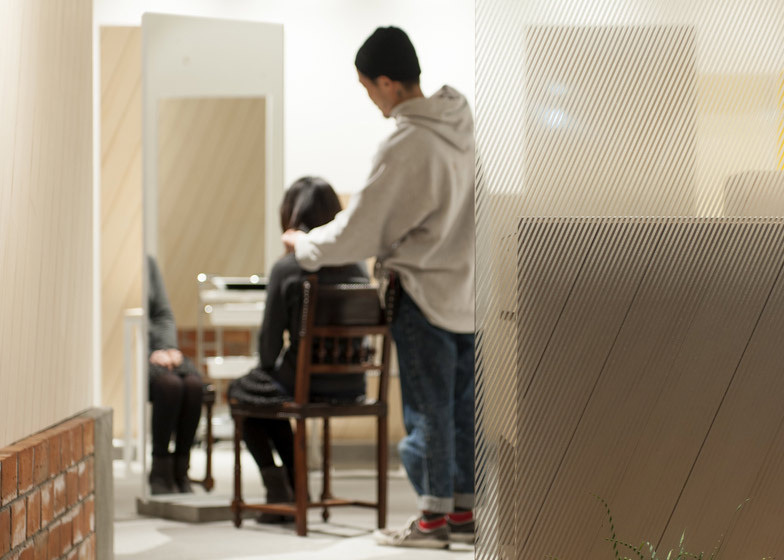 Generally, a hair salon has a conventional traffic line of waiting, shampooing, cutting, and so on. 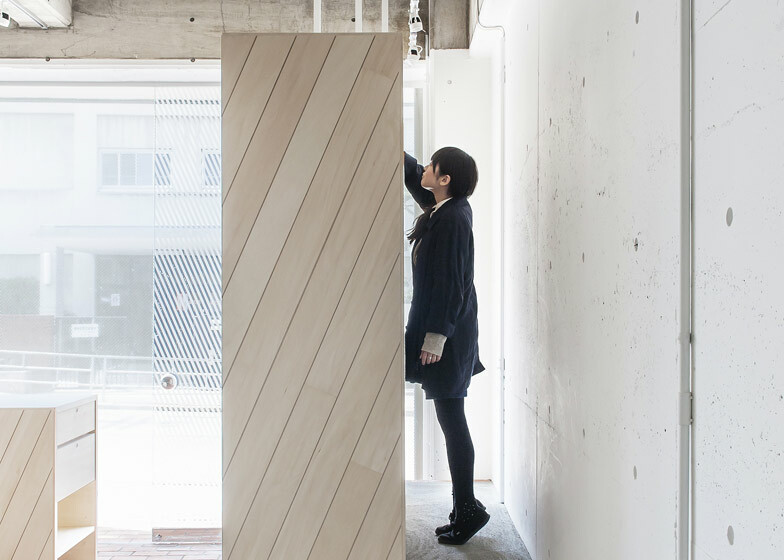 To add uniqueness, I dotted some visually standardized box-shaped objects such as furniture and a spot that have roles. 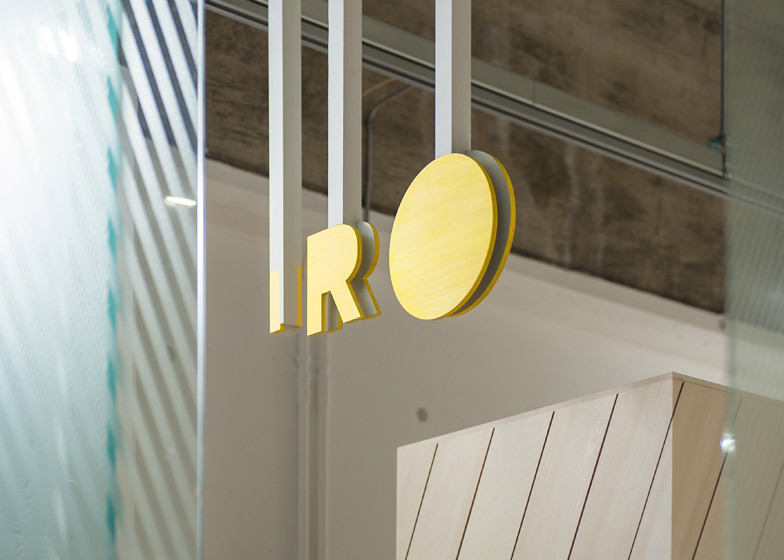 The angle of the diagonal lines which constitute the facade and the interior visual effects follows the concept of the logo "IRO". The "O" in the logo "IRO" is rotated 23.43 degrees to be parallel to the axis of the earth. 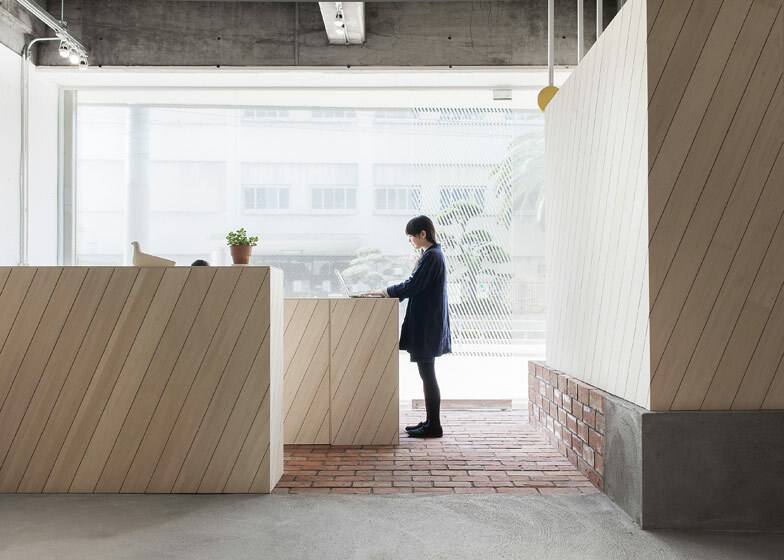 Even though the Japanese word "IRO" means colours in English, we considered it as what gives us the seasonal indications with the Sun, instead of as being colourful. 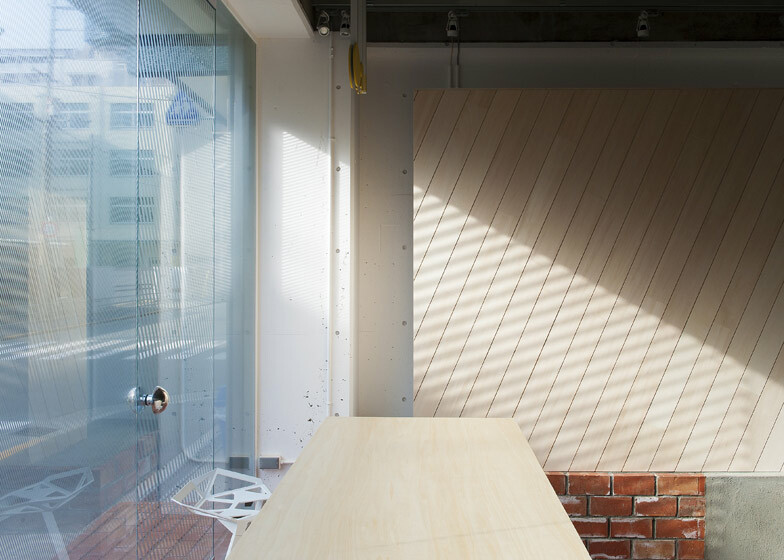 The light streaming through the diagonal lines and its shadows shifts from season to season. 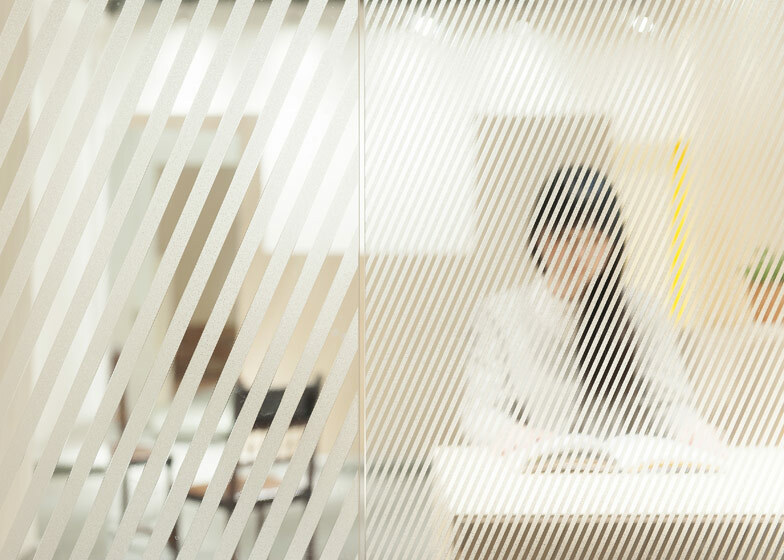 Additionally, the moiré effect caused by the overlapping lines helps to bring out the visual movement in the design.